Those of us interested in Mesozoic animals frequently lament the lack of any good, especially useful books that review our knowledge of Mesozoic marine life. But it’s not all bad, since we at least have this wonderful, weighty, very detailed volume. Oceans of Kansas is by far the best there is, and it’s a must-have. Ok, the limitation is that it’s devoted, of course, to Late Cretaceous North American seas alone – specifically, to the Western Interior Sea that once extended north-south across the whole of North America – but this is no fault of the book but its main feature. Indeed, Oceans of Kansas is successful enough that this is its second edition, and it’s newly expanded, revised and augmented, so much so that those owning the first, 2005 edition should consider buying this one too. Everhart devotes chapters to sharks, bony fishes, turtles, the various plesiosaur groups, mosasaurs, pterosaurs and dinosaurs as well as invertebrates, the history of our discovery of the Western Interior Sea and more. At 427 pages and about 3.5 cm in thickness, this book contains a huge amount of information. It feels like the compilation of a dedicated person’s life’s work, and I hope the author doesn’t mind me saying that. Excellent colour photos and numerous diagrams and other illustrations appear throughout. Many of these images are rare or novel and there’s much here not available elsewhere. A colour plate section features art by the late, great Dan Varner, a friend and correspondent I admired and liked a great deal. Dan’s paintings are looking a bit dated now in view of recently acquired information on mosasaur anatomy and we’d all love to know what Dan would have done with them had he the chance (he died in 2012). Regardless, they’re fantastic pieces of work. One of Dan Varner’s greatest illustrations (in my opinion): the shark Cretoxyrhina takes out a Tylosaurus. This and many other Varner pieces feature in Oceans of Kansas. Image: (c) Dan Varner/Oceans of Kansas. Everhart’s text combines historical review with discussions of what we know, or think we know. There are also numerous personal anecdotes about how various specimens were discovered, recovered and interpreted as well as discussions on how relevant ideas on Cretaceous marine life have developed or changed during the time in which the author has been involved. As he explains, some ideas (those on mosasaur skin and physiology, for example) have undergone substantial revision since he published the book’s first edition in 2005. It’s this personal touch that I enjoy the most. I say again that Oceans of Kansas is absolutely a must-have if you’re interested in Mesozoic marine life. In my work as a vertebrate palaeontologist and researcher I’ve consulted it hundreds of times, and – like all very good books – it’s not just a great source of information but also a joy to look at. Michael J. Everhart. 2017. Oceans of Kansas: A Natural History of the Western Interior Sea, Second Edition. Indiana University Press (Bloomington, Indiana), pp. 427. ISBN 978-0-253-02632-3. Hardback, index, refs. Here at amazon, here at amazon.co.uk, here from the publishers. Much of the fandom that developed around Katrina van Grouw’s 2013 The Unfeathered Bird did so because of its spectacular, beautiful illustrations (van Grouw 2013). Van Grouw’s newest book – 2018’s Unnatural Selection – has a similar format and design and is also spectacularly well illustrated; it is, however, an important work of literature, not of illustration or art alone. I’ve already said quite a fair bit about this book – I wrote a long article on its contents, published before it was out – back in May 2018 at ver 2, so will be brief here. Divided into four main sections (Origin, Inheritance, Variation and Selection), Unnatural Selection describes and celebrates selective breeding and its results. We’ve bred animals with all manner of anatomical novelties not present in their wild ancestors, and – as van Grouw explains right at the start of the book – have ended up with domestic hybrids and variants that are so modified that ancestry has been obscured, or are hybrid mish-mashes of more than one species. Unnatural Selection showcases an extraordinary number of unusual domestic animals (these are all domestic pigeon breeds), but the main theme is the evolutionary plasticity, and potential, that human selective breeding has created in these species. Image: van Grouw (2018). There’s a huge quantity of information here on the diversity of domestic animals and the backstories to them. Van Grouw talks about specific breeders and what they aimed to do with particular animal breeds, as well as the (sometimes erroneous) ideas on why certain breeds are the way they are. But… this isn’t really what the book is about. The main thrust here, instead, is to highlight how selective breeding has enhanced and modified the variation and plasticity present ancestrally in the animals concerned, and on how selective breeding is super-rapid, human-controlled evolution, echoing, mirroring or replicating that which has occurred outside of human influence. Geese (wild and domesticate) from Unnatural Selection. This panel combines Katrina’s illustrations with Natee Himmapaan’s amazing skills in writing and labelling. Credit: Katrina van Grouw/van Grouw (2018). If you’re interested in the diversity of domestic animals, in evolution, or in anatomy, you absolutely must get hold of this remarkable book, and all the more so and if you enjoyed The Unfeathered Bird. Katrina van Grouw. 2018. Unnatural Selection. Princeton University Press (Princeton and Oxford), pp. 284. ISBN 978-0-691-15706-1. Hardback, index, refs. Here at amazon, here at amazon.co.uk, here from the publishers. Why certain things have happened in evolutionary history, why certain other things haven’t happened, and what things might be like had events took a different turn has, as you’ll know, been a popular area of discussion in this neck of the woods since whenever. Broadly speaking, I have SpecBio in mind: big-brained dinosaurs, an Earth ruled by giant lizards, that sort of thing. If this subject interests you, you absolutely have to read Jonathan Losos’s Improbable Destinies. Inspired (in part) by Gould’s argument in Wonderful Life that evolutionary history is and was dependent on contingency and not destiny, and with something of a herpetological bias linked to his specialisation as a student of anoles, Losos explores the Park Grass Experiment, guppy and stickleback variation, fruit fly studies, disease biology and more. My own biases mean that I especially enjoyed his take on dinosauroids (“… to my surprise … The dinosauroid hypothesis was alive and thriving in cyberspace”; p. 323), both the Dale Russell version and the Kosemen/Roy one (yes, there is an illustration), and I think I recall providing him with some of the relevant literature (Naish 2008). The same chapter also includes a discussion of Perry the Platypus and platypusoids (yes, really), E. O. Wilson’s thoughts on extraterrestrials, and, ugh, Simon Conway Morris’s take on the whole thing. 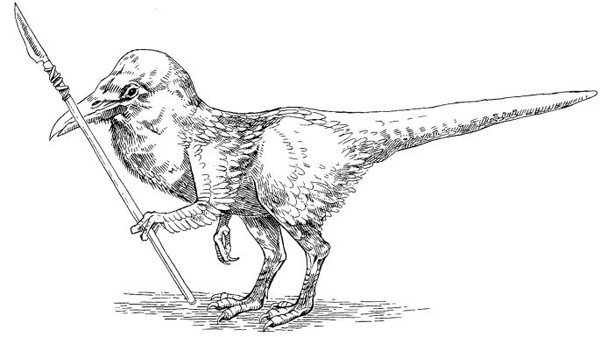 Marlin Peterson’s re-drawing of one of the Kosmen/Roy dinosauroids, from Jonathan Losos’s Improbable Destinies. Image: Losos (2017). Losos’s writing is fun and eloquent and the book is really well designed. References and detailed footnotes are included, and the black and white illustrations by Marlin Peterson are really nice. If you enjoy reading this blog, you will like this book. UPDATE: hilariously, I just discovered that I reviewed this book before, here at TetZoo ver 2 in December 2017. I covered exactly the same points because my brain only works one way. Jonathan B. Losos. 2017. Improbable Destinies: Fate, Chance, and the Future of Evolution. Riverhead Books (New York), pp. 368. ISBN 978-0-399-18492-5. Hardback, index, refs. Here at amazon, here at amazon.co.uk, here from the publishers. Most people reading this, especially those interested in the portrayal of animals in art, will be familiar with the several works of naturalist, ornithologist and artist John James Audubon (1785-1851). Audubon is most famous for his grand, lavish The Birds of America, published between 1827 and 1839 and involving years of work, massive investment and hundreds of illustrations. But he should be just as well known for his equally momentous and lavish The Viviparous Quadrupeds of North America. This new book – including contributions from nine authors, and edited by Charles T. Butler – reproduces all 150 prints from that work, includes a great deal of material that essentially serves as ‘the making of The Viviparous Quadrupeds of North America’ (actually, this is the exact title of Ron Tyler’s article within the volume), and also features sections of text on the history of conservation and natural history in North America, and on how human-wildlife interactions have changed since Audubon’s time. Footnotes cite the relevant correspondence and literature. These ‘introductory’ sections take us all the way to p. 84, so this is a substantial volume (31 x 26 cm, 280 pp). As goes the illustrations, the quality of reproduction is outstandingly good. The colours are deep and vibrant, and the level of detail that shows up in magnified sections is impressive. Aubudon was really good at drawing hairs, and my god his skunks, foxes, bears and others clearly involved a lot of work and are quite something to examine in detail. The plates are reproduced in entirety, but magnified sections are also included for some of them as well, and it was these that I enjoyed looking at the most. The volume ends with a timeline that explains every step in the creation of The Viviparous Quadrupeds, including reproductions of correspondence and colour maps of Audubon’s journey. This is a grand, beautiful book that will be appreciated by anyone interested in mammals or natural history more broadly. Those especially interested in Audubon and his work will appreciate the biographical and background information, and those who don’t own previous reproductions of The Viviparous Quadrupeds (I imagine that that’s most of us) will enjoy the excellent reproductions of his art. Marilyn Laufer, Ron Tyler, Charles T. Butler, Dennis Harper, Daniel Patterson, Sarah Zohdy, Robert A. Gitzen, James B. Armstrong & Christopher A. Lepczyk. 2018. 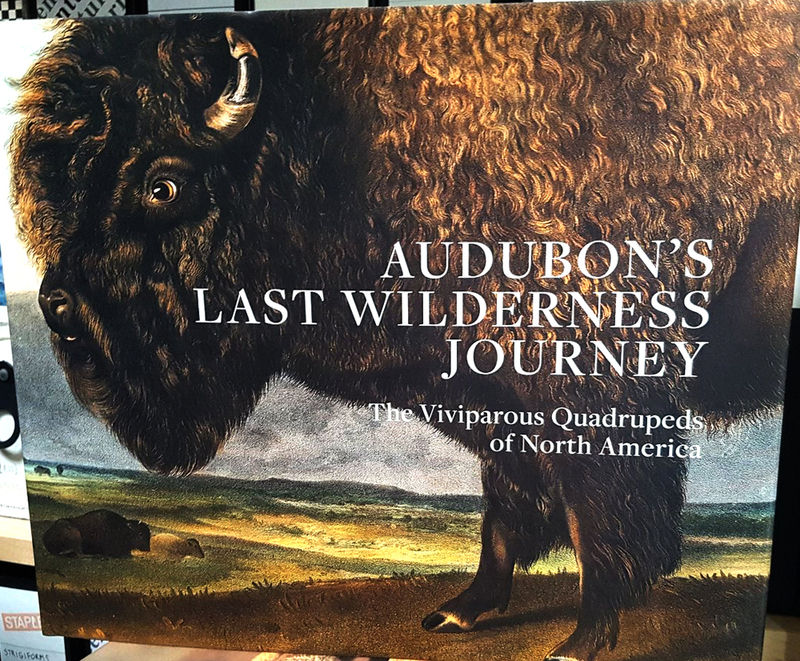 Audubon’s Last Wilderness Journey: The Viviparous Quadrupeds of North America. Jule Collins Smith Museum of Fine Art, Auburn University/D. Giles, London. pp. 280. ISBN 978-1-911282-10-5. Hardback, index, refs. Here at amazon, here at amazon.co.uk (where title is spelt wrong.. I have told amazon), here from the publishers. It has always been a great paradox to me why books on the evolutionary history of birds are so incredibly rare. There is – as you’ll know if you’re at all familiar with books on natural history – a wonderful yet maddeningly frustrating never-ending glut of excellent, glossy, beautiful, horridly expensive books on birds, year on year on year, yet bird evolution just never gets covered. Regular readers will know what I think of Alan Feduccia’s idiosyncratic, biased and utterly misleading writings. It is a major problem that there has long been a total shortage of reliable books on bird evolution. Alan Feduccia’s books - two of which are shown here - are unreliable and misleading. Images: Yale University Press (left); Yale University Press (right). John Reilly’s volume substantially alleviates that gap in the market (yes, I do know about Gerald Mayr’s books), and it’s really good. Written very much in the format of Dawkins’s The Ancestor’s Tale (which I confess to not liking all that much, ask me if you want to know why), The Ascent of Birds is a very dense, very well informed, mostly up to date tour of the bird family tree, its structure following molecular phylogenies like those of Hackett et al., Jarvis et al., Prum et al. and so on: specifically, he follows the topology published by Jetz et al. (2012). I guess he used Jetz et al. (2012) specifically because it was the most up to date at the time of writing (various of its conclusions have been replaced by those more recent studies). My own (now dated) review of bird evolution (Naish 2012) is cited, but I think only as a source of information on passerine genitalia. Ok. The excellent cover art - featuring paintings by Jon Fjeldså (whose illustrations appear in several of his own papers) - depicts the cladogram published by Jetz et al. (2012). Image: Pelagic Publishing. Chapters discuss lineages in the order of their branching in the Jetz et al. cladogram.. broadly speaking (there are actually a few deviations). Each combines something on the general history of the lineage before focusing on a story specific to one, some or all members of said lineage. The chapter on albatrosses, for example, examines models of albatross biogeography before discussing dynamic soaring behaviour and olfactory biology while that on corvids mostly focuses on cognitive skills and their evolution. We thus get a broad-brush picture on the group’s evolution before zooming in on something more specific but still relevant to the group’s story as a whole. This works really well, and Reilly focuses on things that are – in my opinion – more interesting than Dawkins did. References are provided throughout, most chapters contain a diagram or two, and a colour plate section includes images of fossils and living birds relevant to the main prose. 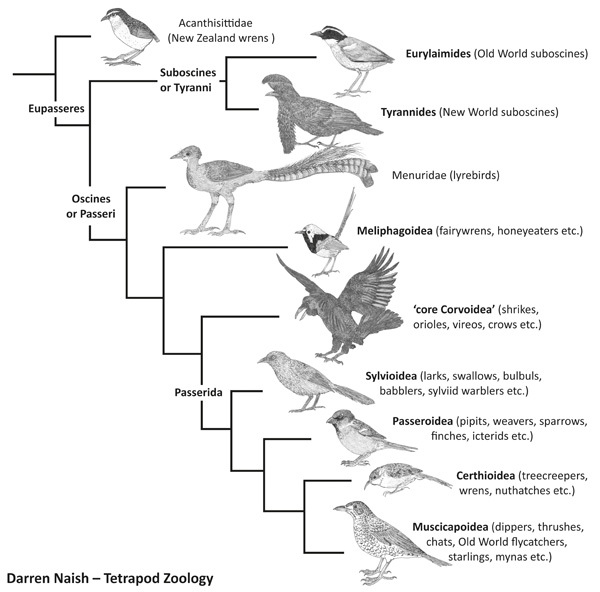 There are a lot of passerine lineages: this simplified cladogram features the major lineages only. 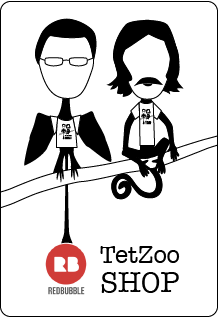 It is fitting that about half of Reilly’s The Ascent of Birds is devoted to this one group. Image: Darren Naish, from my textbook project. Long-time readers will know that I once invested considerable time in a book that, similarly, took its readers on a tour of the modern, molecular avian family tree. It was less prose-based than Reilly’s book, and with more focus on images, and was ultimately abandoned due to lack of interest from publishers (part of the story is discussed here, though the article concerned is now lacking all of its accompanying images). Reilly’s book does what my book should have done, but in a far more detail-oriented fashion, meaning that we finally have a good volume presenting the vast amount of modern work done on bird evolution to those interested. This is a notable achievement and has been well executed. Screengrabs from the aborted Naish ‘The Bird Family Tree’ book. Yes, I should pick it up and get it published. No, I can’t do that due to a list of other projects that prevent such action. Images: Darren Naish. John Reilly. 2018. The Ascent of Birds: How Modern Science is Revealing Their Story. Pelagic Press (Exeter), pp. 340. ISBN 978-1-78427-169-5. Hardback, index, refs. Here at amazon, here at amazon.co.uk, here from the publishers. Originally published in French, and translated into English by Tony Williams, Geniez’s Snakes is a compact, attractive, well designed and pleasingly thick volume, definitely one to get if you’re a snake specialist. An introductory section covers snake natural history, biology, habitat, the effects of snakebite and classification; the rest of the book – which goes through the species on a family by family basis – covers ‘identification’, ‘range’ as well as diet, reproduction and so on for each species (where available) and is especially good on intraspecific variation and proposed subspecies. Geniez has gone to some trouble to use the newest ideas on taxonomy and phylogeny, the various boxed-out sections providing discussion on genera and their contents. So, you’re going to meet Myriopholis, Spalerosophis, Platyceps and others, if you haven’t already. There are already a few (mostly very good) fieldguides to the reptiles of the European field guide region – this typically being taken to include northern Africa and at least part of the Middle East too – so what is it that makes this book different as goes which taxa it includes? Well, there are quite a few species from outside the region usually covered, including a few surprises – too many to discuss here. I will say that they include the Brahminy worm snake Indotyphlops braminus (yeah, not Ramphotyphlops anymore), California kingsnake Lampropeltis californiae (yup: introduced to the Canary Islands and now abundant there, and also known from Spain), and the as-yet-unnamed Israeli whip snake. Pages from Geniez (2018). It’s a great-looking book. Image: weboryx.com twitter account. This is not a ‘fieldguide’ in the sense of having plates depicting related species in close proximity. Instead, photos (taken by a long list of different photographers) are distributed throughout the text. But they’re outstandingly good and make this a very colourful, attractive book. Strongly recommended for those of herpetological inclination! Philippe Geniez. 2018. 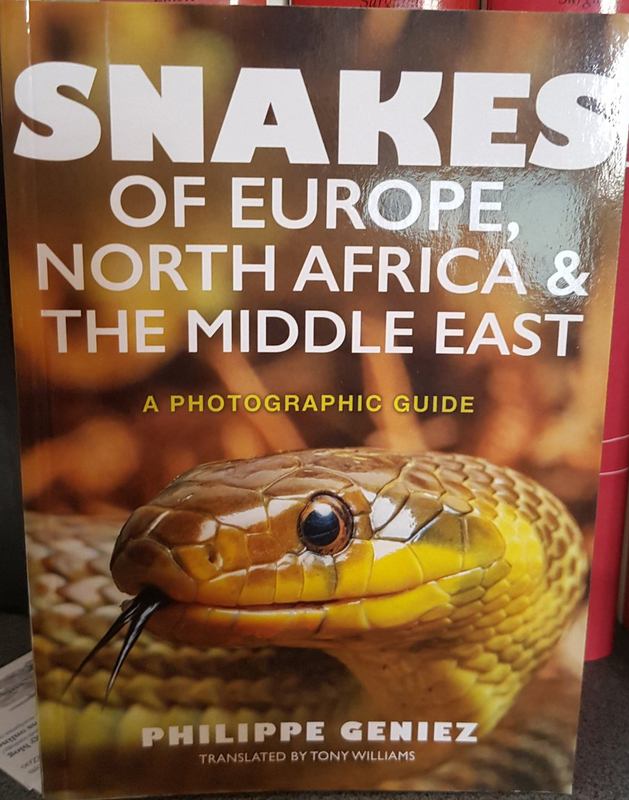 Snakes of Europe, North Africa and the Middle East: A Photographic Guide. Princeton University Press (Princeton and Oxford), pp. 379. ISBN 978-0-691-17239-2. Softback, index, refs. Here at amazon, here at amazon.co.uk, here from the publishers. Geniez. P. 2018. Snakes of Europe, North Africa and the Middle East: A Photographic Guide. Princeton University Press, Princeton and Oxford. Jetz, W., Thomas, G. H., Joy, J. B., Hartmann, K. & Mooers, A. O. 2012. The global diversity of birds in space and time. Nature 491, 444-448. Losos, J. B. 2017. Improbable Destinies: Fate, Chance, and the Future of Evolution. Riverhead Books, New York. Naish, D. 2008. Intelligent dinosaurs. Fortean Times 239, 52-53.
van Grouw, K. 2013. The Unfeathered Bird. Princeton University Press, Princeton and Oxford. Posted in book reviews, books and tagged with books, book reviews. February 8, 2019 by Darren Naish.